Last weekend I had great fun helping out my friend Peter who was race director at the Weardale triathlon. A sprint distance event, it took place in Stanhope, starting in the heated outdoor pool where I was one of the lane counters. It meant an early start, but that’s typical for a triathlon weekend, and it was great to see the event and help out as a volunteer. 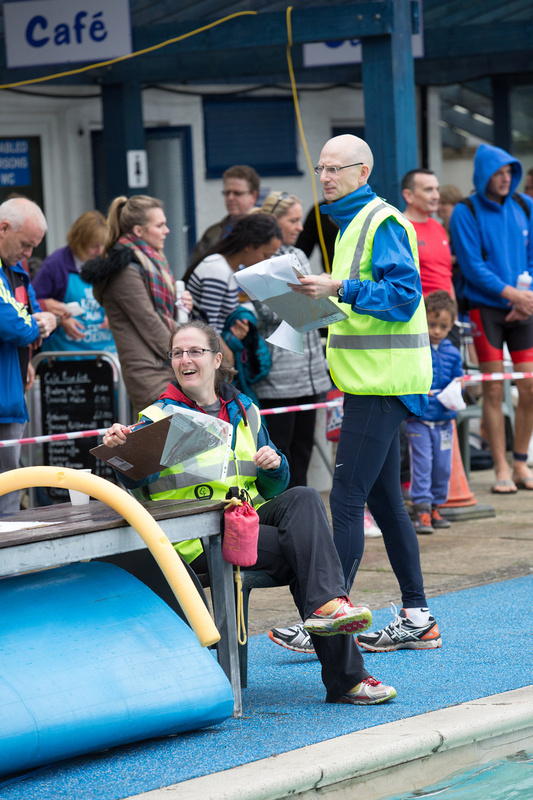 I’m always really grateful to the organisers and marshals who give their time so that I can enjoy a fantastic race, and I know that triathlon in particular takes a ready crew on hand to get things organised and make sure things run smoothly. A smile, or a friendly face can help calm nerves and an encouraging comment or ripple of applause can really help lift you in a race. Marshals are most likely there earlier and staying out on the course later than most of the competitors, so next time you’re out racing, give them a thumbs up or a thank you, if you have any breath left! Anyway, I really enjoyed my stint as a length counter, despite apprehensions that I’d mess it up and miscount. I find it hard enough to keep track of my own lengths when swimming, let alone being responsible for other people’s. But there was a good system with a check sheet to tick off every two lengths, and with only a maximum of four in the lane at one time, it went very smoothly. It was good to see all the different swim styles and to hear people nervously admitting this was their first tri as they were getting their poolside briefing. Seeing the first swimmers in reminded me of my first events where I spluttered through with a mixture of front crawl and breast stroke and held on for dear life to catch my breath every time I got to the side. Thankfully, these swimmers were somewhat better prepared. Once the pool had cleared, I stepped over to the transition area where competitors were still heading out on the bike and run and cheered a few over the finish line. The people who run the pool had put on a fantastic spread of cakes and had been frying up bacon and sausage butties all morning, so I was well fed for all my hard work, sitting and counting. I still think of myself as a tri tiddler, and know there are many more worthy of interest achieving great things in this multi-sport event. But I guess my enthusiasm comes through. So it was great, and long overdue to be able to give a little something back and to help out at a fantastic and tiddler friendly event. With my enthusiasm for triathlon, I was very disappointed to learn that my next event, the Newcastle triathlon, has had to be moved. Originally conceived as a new city centre tri with a swim in our iconic river, closed bike route and flat course, it had attracted a lot of interest and was set to be a real highlight of the season. But, after two years’ hard work, securing permissions and negotiating with all the relevant authorities, it seems that permission for the river swim was rescinded. The organisers, V02 Max Racing Events are massively disappointed too. They put on fantastic local events (including the Northumberland tri which I last raced at), all as well as holding down full time jobs. But they have found a way to offer a great alternative and are focused on making it the best event it can be. 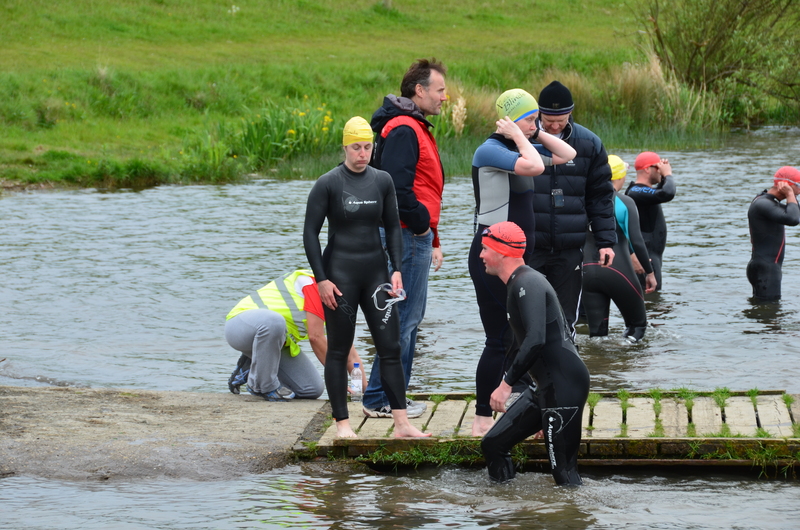 I know it will be a fantastic event , as the alternative course is at the QE2 lake, beside Woodhorn Colliery Museum, where I took part in my first open water event in 2012. I’m working on building up my run mileage in training now to give myself a good shot at the Great North Run in September, but I really feel like I want to give this triathlon my best too, as a way of recognising the effort that goes into organising the events I enjoy. It’s fair to say I was quite nervous about doing my first tri of 2014 at Alnwick. My training’s been a bit inconsistent and mainly run focused and I’ve had very little time on the bike. But, having never done this race before, I had no performance targets to compare myself against and approached it as a good Sunday training session. I can see now why this event gets booked up so quickly. 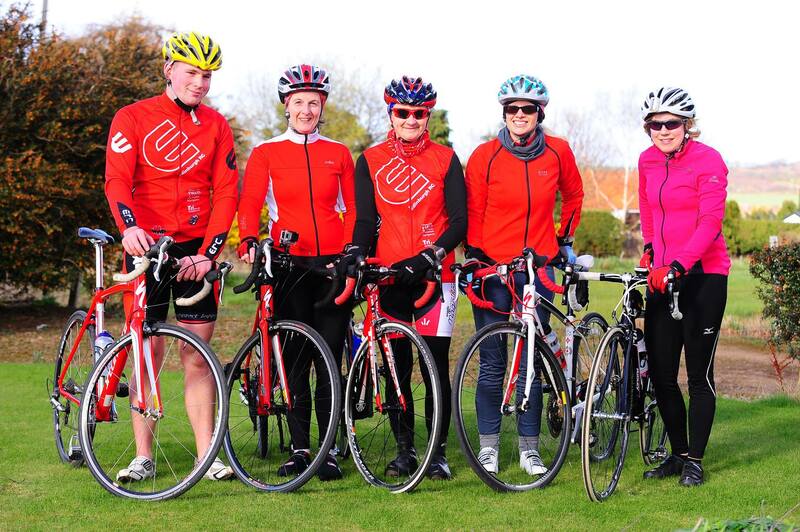 It’s well organised, very friendly, with top marshaling and a great season opener. I’d definitely do it again. I arrived quite early, but was glad of extra time as a road closure meant I had to take a diversion to get to the Willowburn sports centre. I registered in the sports hall where there were lots of people sorting out numbers and goody bags, so it was very speedy. I checked my number and swim time on the list on the wall – last but one, in the pool at 09:11:40. That meant a long time to hang around and get nervous. I knew I had to have my bike racked before the race briefing at 07:25, so collected my kit and set it all out in transition. For once there was plenty of space on the racks, and a nice little touch was having your name marked with your number. As I made my way back into the building, Stuart, a Fetchie pal, spotted me and said hello. It was really nice to see a familiar face. Although I know quite a lot of people in North East triathlon, not being part of a club can make you feel a bit lost turning up at a race. I also bumped into a couple of people from my tri coaching course, so started to feel more at home. The race briefing was straightforward and left me enough time to walk back through transition and get my bearings before the elite women were first off in their race at 8am. I still had loads of time for the nerves to build and to wonder what to do with myself, so I checked into social media and got some encouraging good luck messages. I went to watch the start of the swim, to see how it worked and to familiarise myself with the pool. The first girl was off like a rocket and soon 100m ahead of the next swimmer. Starting people off at 20 second intervals and keeping them moving from one side of the pool to the other, meant there was a continuous stream of swimmers, and not too much overcrowding. I’d been unsure what to do with my kit, especially my car keys during the race, but discovered the sports centre lockers were big enough to fit my tri bag, which just left me with one of those locker keys in a plastic holder that straps round your wrist. My nerves were building with the wait and hearing snippets of nervous conversation from others getting ready for their turn, so I took myself off to a quiet area of the car park and ran through some warm up drills. This really helped settle me before I went to strip off my final layers and wait beside the poolside. I took some more deep breaths and did some stretches, trying to give myself the best shot at a controlled and panic free swim. It was almost all undone when I finally got into the water and ducked below the surface to get my face wet and practice breathing out, only to come up with a splutter, realising I couldn’t touch the bottom. I didn’t think I’d got it under control when I got the 3,2,1 go! But I was off and swimming and the adrenaline rush was under control. After a real confidence booster open water swim on Thursday night, I resolved to keep it controlled and easy, making the most of rolling to breathe in and pulling right through my stroke. I’m afraid technique gets a bit lost when I’m racing, but I did my best. Ducking under the lane ropes after 4 lengths was a new one for me, and I thought it would give me a bit more of a breather, but as I moved into the centre lane, I took on a mouthful of water and spluttered. It gave the guy who had been last in, but who was catching me, the chance to duck in front. With half the swim done, I was annoyed at myself for losing a place I didn’t need to lose, so I kicked on and managed to pass him in the last 100m. Up and out of the pool and round to transition with no hassle. I was a smidge slower than the girl ahead of me and the guy behind me in transition as I’d opted for bike shoes and they just went with trainers, but it was still a decent changeover and I was off and out onto the bike and into the unknown. I hadn’t checked out the course, other than the online maps. This was deliberate on my part, as I didn’t want to over complicate and add pressure to my preparation. 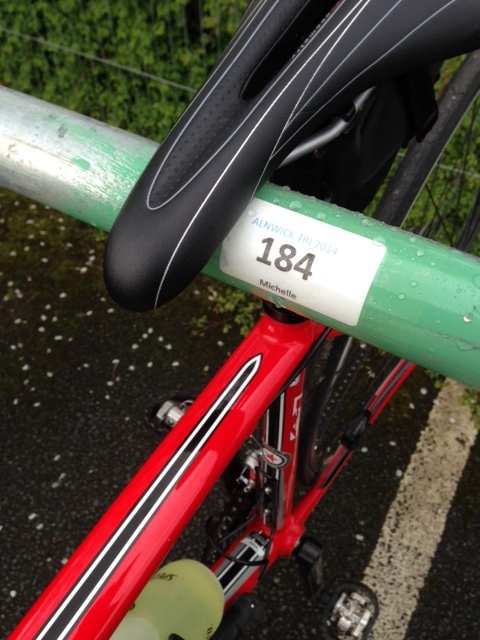 I’m not the fastest cyclist anyway, so it was just about seeing how I got on. I knew, from talking to a friendly couple before my swim that there were two significant hills, but was reassured, that despite one being called ‘Heartbreak Hill’, it really wasn’t that bad. I kept the bike in low gear through the first few twists and turns until I got a clear patch of straight road where I felt confident to hit the big ring. The course is undulating, so I was clicking through the gears nicely, trying to keep the cadence up and grateful for my bike service this week, which meant everything felt smooth and easy. I almost took a wrong turn, despite at least three marshals pointing me to the right, because I’m dozy, and corrected it by making a wide turn behind a lady marshal. I really enjoyed the route, it had enough twists and turns and up and downs to make it interesting and most of the time I could see a rider ahead, which made me feel less lonely. I’d opted just to ride in my tri suit, leaving my jacket in transistion, gambling that it wouldn’t rain or that any showers would be short. My shoulders were a little cold when the wind picked up, but I’m always amazed at how much warmer I am when racing than when training – must be all that adrenaline. I managed to catch and pass the lady in front of me, after working hard up the first real incline. Then I think I must have taken my eye off the ball a bit and drifted into ‘hello trees, hello flowers…’ as she passed me a little later on the straight. But she shouted something encouraging as she went buy and I kept her in my sights. Once again I passed her, working up a bit of an incline, and she shouted, “You know there’s a big hill coming up?” I did sort of, but it was good to know that would be it. I pushed on, dropped down through the gears and told myself I was strong. I was compensated by a really nice stretch of downhill, onto the drops and feeling quite daring, not touching the brakes through a dip and a turn. My bike was handling beautifully. Unfortunately numpty head was on, and in trying to move the plastic wrist strap holding my locker key so that it didn’t dig into my hand, I managed to undo it. ‘Argh, don’t drop it’ I though as I made a grab for it. But of course I did. Stop the bike, turn round to see a car and cyclist fast approaching; backtrack a few yards pick it up, put it in my back pocket. Back on the bike, but having lost that place. “Bad luck,” she shouted as she passed. Nice lady. Numpty error number two. There wasn’t going to be a number three. I knew I could catch her, so I put the effort in, gave it a bit of a sprint and pushed on. It was actually a blessing in disguise, as it stopped me drifting into easy cycle mode and made me up my game for parts of the course. Now the aim was to keep her behind me to the finish and see if I could gain ground on the rider ahead. I never did manage to make up the distance to the one in front, but tried to make sure I put as much between me and the lady behind, before I dropped down the gears coming into the sports centre car park and got ready to dismount. Back round into transition again, bike racked and shoes changed. She was a fraction of a second ahead of me, due to her position in the racks and not changing shoes as we set off for the run. Out across the road and into the fields. I knew this was an off road run, and was expecting it to be tough, but I hadn’t realised I really needed to do cross country training for it. The first part was pretty much all grass, round the edges of the playing fields. And after the recent rain, wet, soggy and muddy grass. And it was uphill. Legs still in changeover mode, it was pretty brutal and ‘little steps, little steps’ went through my mind hundreds of times. As we turned onto something more of a trail like path with slightly better grip, but a steeper slope, the woman ahead started to walk. ‘Not walking. Not today’ I said to myself, even though I was barely above walking pace. She gestured me past, no doubt hearing my huffing and puffing, and I checked she was okay, not injured. “No, just shattered,” she replied good naturedly. The up was relentless and it got steeper as we passed into a farm yard, so although the ground here was firmer, loose pebbles meant you still had to watch your step and keep your eyes upwards. I was convinced that was it, but there was a bit more, a more level path out to the turnaround point at which my running companion passed me. I kept her in my sights, thinking it’s all downhill from here, and that if I stayed within 20 seconds of her, then that would still gain me a place. I really hadn’t enjoyed the run out and up, but the route back down made it much more bearable. Here, at last I was able to find my legs, stretch out a little and let go. It started to feel like I was running something like my current pace. I didn’t manage to catch the lady in front, despite a Scribbler style short sprint to the line, but I had the honour of being the last competitor to cross the line and resounding cheers all the way. It felt great. And I remembered why I do this crazy sport. It does make you feel good. It is a friendly and supportive atmosphere. And it is a challenge. I messed up the Garmin recording (again) so won’t have accurate times until they’re published by Alnwick tri. And I’m pretty confident I won’t actually be last when the results come out as they mixed in a wave of slow swimmers after the elite women. But today wasn’t about times or even feeling self conscious at the back, because I didn’t. It was about getting back into the swing of things, enjoying myself and taking on something I was a bit unsure of. Yes I made some numpty mistakes, but it really didn’t matter. 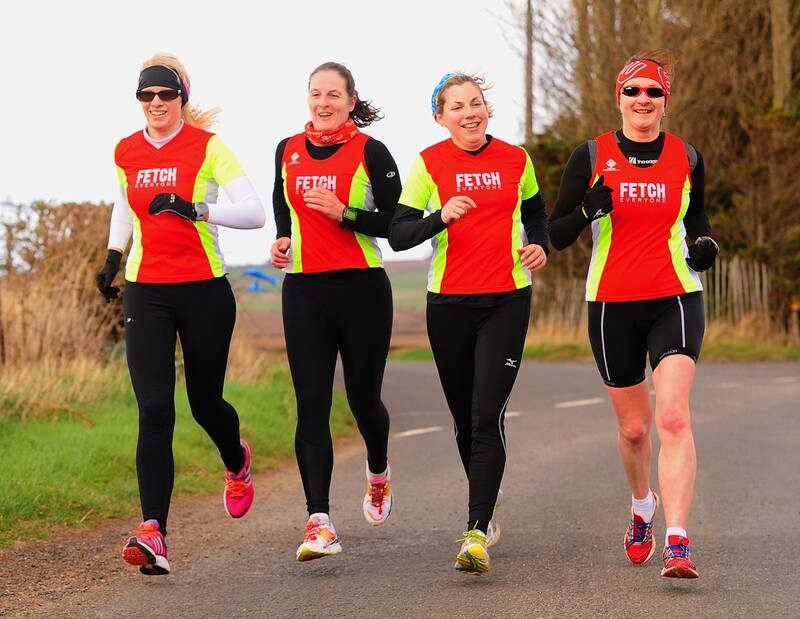 I’ll confess, I’ve had doubts recently, questioned why triathlon, why not just run? But I do still love it. It does still fill me with a much-needed buzz. And now I’m ready for the rest of my season. I’ve been looking forward to and been anxious about this for a while. Grey skies, rain showers and a generally chilly outlook have not inspired me to get into the water. But knowing I have a couple of open water events coming up later in the year, I need to get the practice in. So, last night, I was back for the opening of the open water season at QE2 lake in Ashington. Run by the VO2 Max Racing guys, it’s a great way to get used to open water swimming in a safe environment with canoe support and coaching if you want it. I usually suffer from the shock of the cold and really struggle not to hyperventilate, so my first swim of the season has been a bit of a struggle. But I warmed up a bit on land, then took my time just getting used to the water, splashing it on my face and trying to relax before I swam and I was fine. It was really nice to feel relaxed and not have to tell myself to calm down all the time. I swam nice controlled front crawl with my head in the water, breathing steadily and managing not to veer too far off course. Previously I’ve counted strokes, aiming for 6 then 12 and building up, but I was straight into swimming between buoys without a rest. It did help that the air and water temperature were similar about 12C I think and a good deal warmer than my first dip last year. And I tried out my neoprene cap for the first time too. I swam two loops of the course, roughly 400m with rests at each buoy, and was tempted to do another lap. But I’d decided that 20 minutes would be enough if I was struggling, so I thought it better to get out after 20 minutes and leave with a good experience, than push on and risk tiring myself into a bad one. Next week, I’ll try swimming with the coached group and plan on staying in longer. But it’s the best start to open water swimming I’ve had in the past two years. So, my 2013 tri season is over. Time to take some time out and reflect on how it’s gone and ponder on what I’d like to achieve next year. I completed 6 triathlons, including my first two standard/olympic distance events and my first sea swim. I improved my time massively at two events I’d done the previous year, taking 10 minutes off my time for the QE2 tri which had been my first open water event in 2012. And although you can’t really compare the two olympic distance events, I did improve on my time by 15 minutes at my second attempt. So, I reckon that’s a win for my triathlon season. I did what I set out to achieve, stepping up to the longer distance and enjoying the events I entered. Of course, no race is ever perfect and there’s loads I want to improve on for next year. Oh boy, I still do have my moments when I swim in a race. There are times when I hate it, when I swear to myself I am never doing this again. And yet, I’ve finished them all and got back into the water and raced again each time. So as one of the OW swim coaches advised me, I’m going to look at how far I’ve come and not how far I think I have to go. And that means the swim is a big win. Each time I get better at handling the panic and the stress. And in my last race swim in the pool at Haddington I had a lovely, controlled and totally non-stressed swim. I’ve tackled two 1500m open water swims, including one that measured closer to 1800m and survived my first sea swim (which I actually enjoyed). And in training, I have learned to enjoy open water swimming, particularly when the water has been clear and relatively warm. I’m actually sad to put my wetsuit away as I don’t expect to be able to do another open water swim this year. I’m well on the way to logging more swim time and distance than any previous year. And I’ve been back in the pool already, working on my technique and speed, which I’ll continue to do over the autumn/winter. I’ve already logged more bike mileage than in previous years, thanks to indoor sessions on the turbo or spinning classes early in the year and more miles on the road thanks to the good weather. In the two comparable sprint races, I’ve improved my bike time and I’ve gone longer with the standard distance events. But still I’m passed more than I’m passing on the bike and this is the area where I’m most likely to make speed gains. So the plan is to get myself a proper bike fit, look at aero bars for my road bike next year and get a cyclocross bike to ride through the winter. The rub is that I don’t LOVE the cycle. I have glimpses of loving it sometimes in training or racing on a nice day, or on the few occasions when I’m out riding with my tri buddies. Over the winter, I’ll hit the turbo, and spin trainer when I can’t go outside, but it’s really not my favourite session. I’m toying with the idea of doing a long cycle challenge next year and there will be opportunities to do things like the C2C ride. But, it becomes a commitment in itself and I fear it would detract from other training. If I was out doing 60-100 miles on a bike on a Sunday, I would be expecting too much to be running a training 10k or doing a mile in the pool the following day. Hmm… poor old running. I still love it, but it doesn’t get the love and attention it used to. And that was the deal this year. It just had to look after itself. In comparable tris, I’ve run a little faster than last year, but last year I was coming back from injury, and I haven’t reached the potential of my best year of 2011. I’ve managed the endurance, confident I can run a 5 or 10k off the back of a swim and cycle. But I haven’t quite got up to speed. I had a freak glimpse of form with a 25:10 run at parkrun when I was building up to my first standard distance tri, but I’ve come nowhere near that again. But I’ve done what I needed to run for triathlon. Now, over the winter, I can do more speed work and give it a bit of focus again. Next year, I’d really like to have a go at getting a sub 50 10k and still doing a good number of tris. So I need to think about how best to do that. One thought is to put myself in for a half marathon in the off tri season, to get the miles in and repeat the kind of training that helped me to my previous 10k PB. But I need to avoid the temptation to take on too many different goals. Mixed and inconsistent – some good, some slow and this is an easy place to sneak some time. So I will aim to make this consistent and faster in 2014. I’ve got strategies to combat the race adrenaline nerves and they do work, but I need to make sure I don’t neglect these. Mentally I’ve proved I can stick at a tough long race at Allerthorpe. I’ll be doing tri coaching training in September and October so will need to make time for studying, volunteering and coaching.